What other office has these adorning its desks? We were first given a tour of their downstairs office, in which could be found alongside Paul’s eyrie, Tanya Fish who handles educational outreach, as well as Phil Howard who is responsible for the software behind the Pimoroni products. Straight away we were in to the interesting stuff, as the desks are laden with both the Pimoroni boards already out in the wild and quite a few in development that we hadn’t seen yet. This is an office you would definitely want to work in! Upstairs is Mark, the buyer whose efforts keep the parts coming for Pimoroni’s production. The conversation turns to the global scale of the Pimoroni business, which now has a German operation as a complement to the Sheffield headquarters, and also sells a very significant percentage of its output to the USA. In the next office is Niko, head of Engineering. This is where the hardware takes shape, and his desk is an electronics bench at which no doubt many Hackaday readers would be at home. We were shown some upcoming display panels and a yet-to-be-released breadboard power supply board with a hidden feature of being able to play Snake. An interesting conversation ensued about solderless connections, as they are also working with pogo pins and products with edge connectors. You may remember we reviewed Pimoroni’s solderless hammer-on pins last year, since some customers may not be confident with a soldering iron they are producing more products with that market in mind. [Niko] had the Power Mad on his desk, a versatile breadboard PSU. Does your breadboard PSU play Snake? The warehouse side of the unit, currently houses both the mail-order and manufacturing sides of the business. 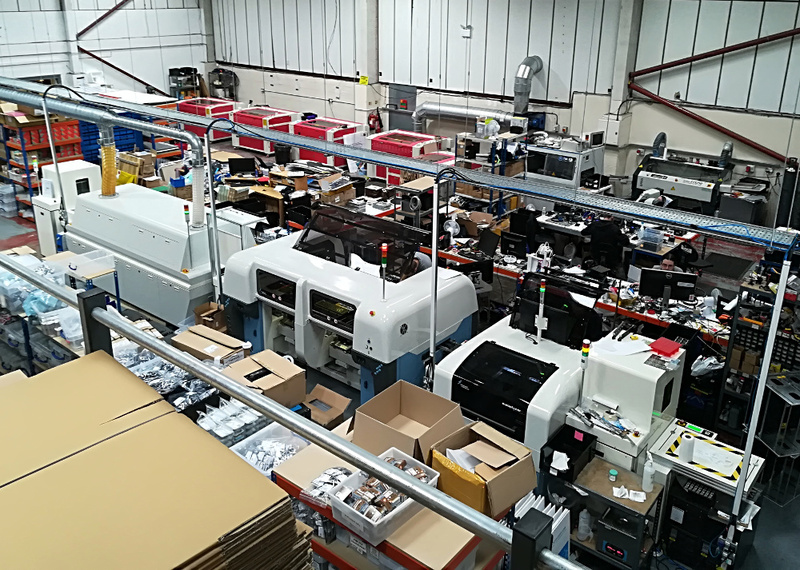 Down the centre of the building lies their PCB production line, with a board loader, solder paste printing machine, pick-and-place machine, and reflow oven connected by conveyor belts. This is a new line for them, we were also shown their first now-decommissioned pick-and-place machines, awaiting a new home. The majority of Pimoroni’s modules are surface-mount, but they also maintain a wave soldering machine for their limited number of through-hole components. We tracked a panel of twelve individual HAT boards trough the machinery, watching LEDs being deposited at dizzying speed. Quality control is rigorous, with inspection between every link in the chain, and a reworking area to which boards are sent which don’t make the grade. The Pimoroni shop floor. Across the centre is the reflow line, against the back wall are the laser cutters. At the back of the unit to one side are the machines that long-time Pimoroni watchers might associate most with the company, their impressive line of laser cutters that fill one wall of the unit. These seemed to be mostly loaded up with PiBow parts during our tour, and are flanked by shelves containing an impressive array of acrylic sheet stock that would make any hackspace green with envy. The manufacturing side of the company is only half of the story, because as well as a producing products they also operate a sizeable shipping operation. 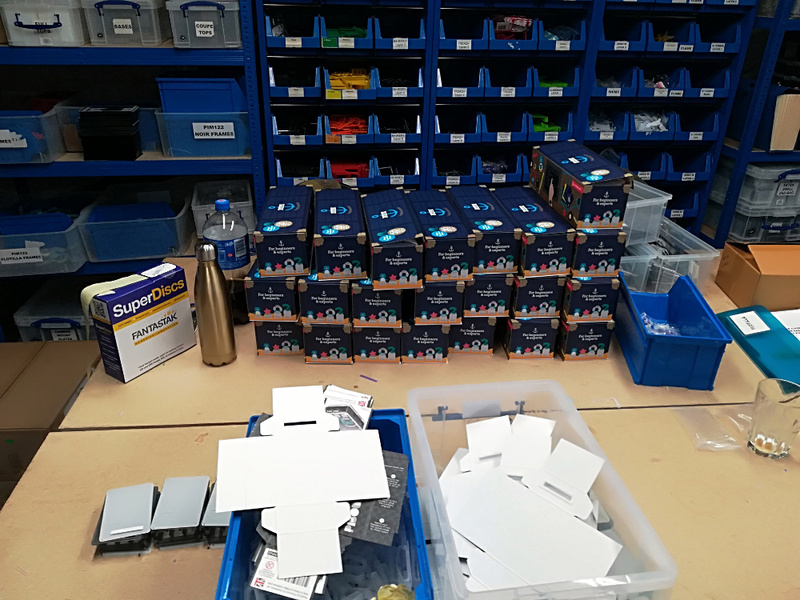 The half of their unit that isn’t occupied by the manufacturing facility is taken up with rows of storage shelves for their inventory, and the team who pack the Pimoroni kits, prepare the orders, and despatch them through Royal Mail to the customers. 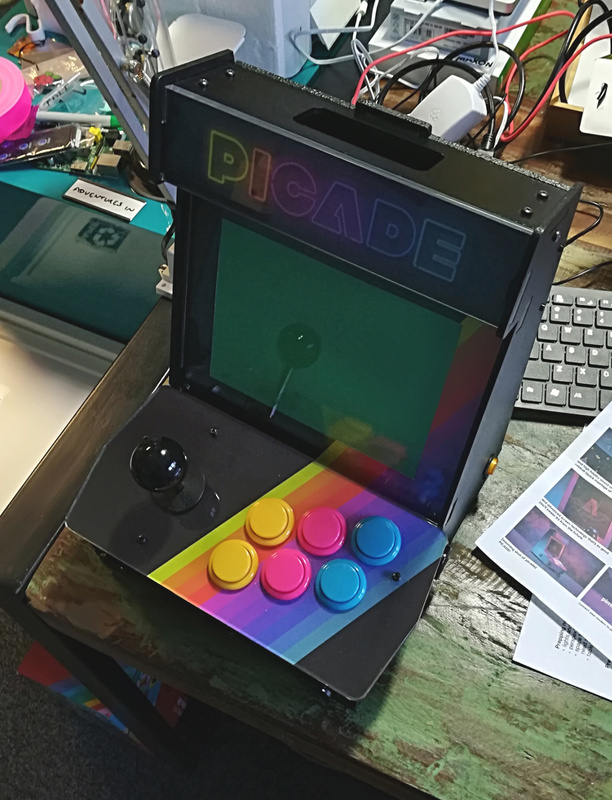 We spent an entertaining minute peering into boxes here, finding everything from thousands of arcade buttons no doubt destined for PiCades, to bags of LEDs and stacks of neatly packaged Pimoroni HATs. If you have ever ordered a new Pi model from Pimoroni on its first day of release you’ve probably been pleasantly surprised by how quickly it is in the mail, these are the people we have to thank for that. 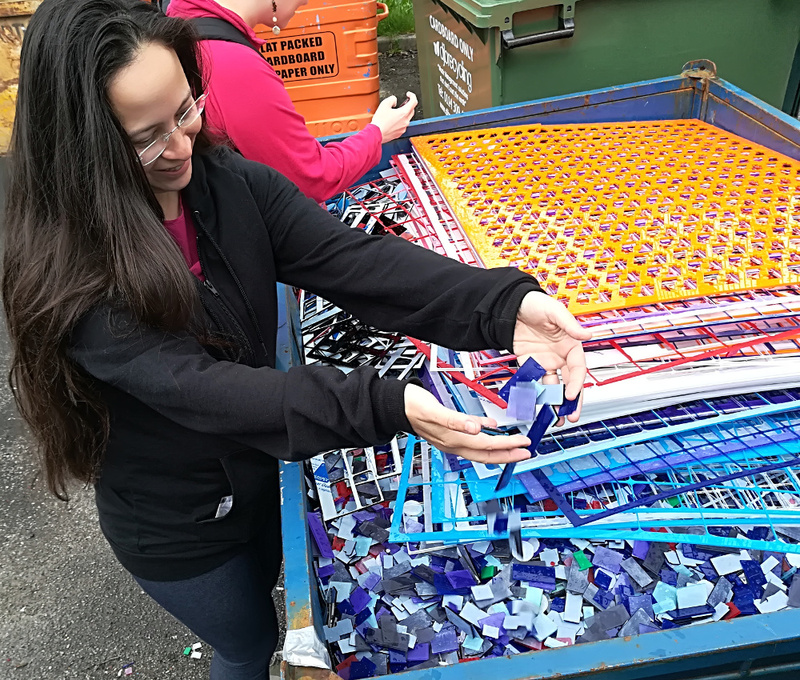 Tindie’s [Jasmine] doing a bit of dumpster diving. After saying goodbye and thanking our hosts for the tour, there was one more destination for the Pimoroni tourist. You can tell a lot about a company from its scrap bin, and since Hackaday writers are generally seasoned dumpster divers we headed across the parking lot for a look. In it were thousands of acrylic offcuts from their laser cutters, piles of neatly shaped small pieces of plastic in a rainbow of colours. Part of me is surprised that they don’t sell these by the pound to crafters, as it was we spent a minute or two playing guess the product from the part. So we set off on our way northwards having had a fascinating morning on several levels. On one hand we’d seen some of the new products from a company that it’s fair to say are one of the Cool Kids in our world, but we’d also had a glimpse into a medium-scale electronic manufacturing facility as well as something of a potted history of the Pimoroni story from small beginnings to what is now a company with a global reach. I had to look that one up, here in the USA “aerie” is the common form. Are you sure? I’m from the US as well, and the “aerie” spelling is unfamiliar to me. Maybe I just consume too much British media. So, the word Aerie is prominently displayed on the side of those buildings. Huh, I’ve never heard of the Fraternal Order Of Eagles either. Must one be an eagle to join, or are other birds of prey accepted? Aerie? They sell cute unmentionables at the mall. It’s been a while since I’ve been to the (any) mall! Surprised they don’t chop and recycle. I think it was in fact their plastic recycling bin, so yes, they do. Still pretty cool though. Non-Chinese, I’ll give them a second look! So, [Jenny], it looks like you are wearing an earring in the dumpster dive photo, but not in the lead photo. That’s not me in the dumpster pic, but somebody else who was with us on the day. They were selling shares in their company a while back via some crowns funding campaign I think. Glad to see they’re doing well. Are you going to Liverpool Makefest? 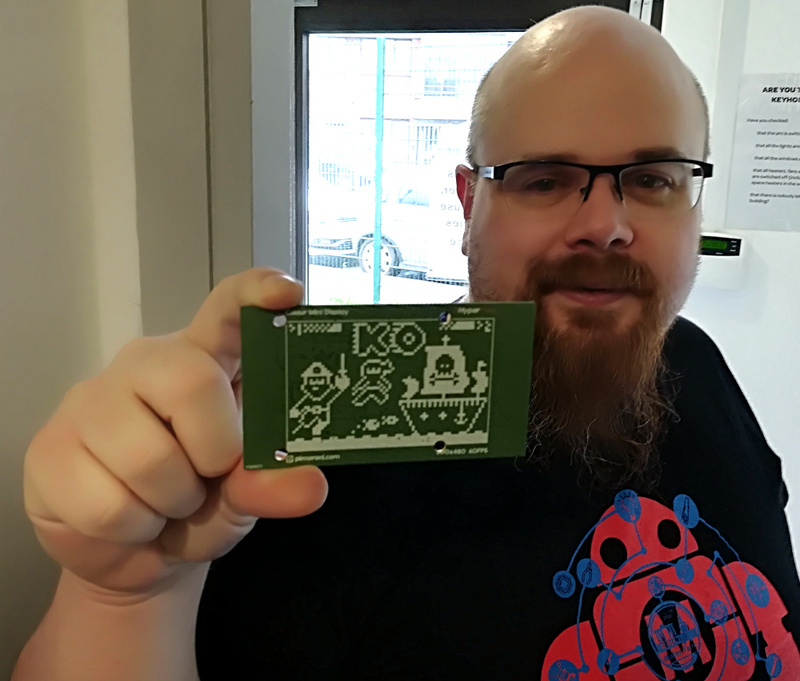 https://lpoolmakefest.org/ 30th June 2018. Not entirely sure yet. But maybe. We’re exhibiting the WEEDINATOR so come and say hello if you like. Does it have flame throwers? Yes of course …… They’ll be demonstrated at the event. Sheffield has electricity now? By ‘eck! Where can I get more info on that powermad power supply? Google was not so friendly. By the way, did they ever fix the hardware issue with I2C clock stretching in the latest Pi? Nope. The SoC peripherals haven’t changed.